Sativa dominant strain with good yields and a long-lasting cerebral high. 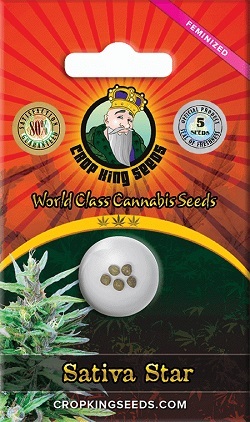 Sativa star cannabis seeds are a 90% Sativa dominant strain,that generates a powerful, lasting high. A long-flowering strain, requiring plenty of space and height to achieve its full potential, expect long running cola’s, thin leaves, and that classic Sativa stretch as flowering commences. Although capable of both indoor and outdoor growing methods, Sativa Star is not the easiest cannabis strain to grow and shouldn’t be attempted by new or inexperienced growers.Its long flowering phase of up to 14 weeks is double the amount of time many Indica dominant seeds require, while needing a lot more care and attention to achieve the best yields. Indoor growers are advised to employ advanced growing techniques such as Topping, Bending and Staking to reduce height issues during the later stages of flowering, with the plants generating an average of 350 grams of the highest quality buds per square meter, given good conditions. Cultivated outdoors, Sativa Star cannabis seeds can produce approximately 600 grams of dried buds per plant, with enough space, good conditions and a long enough flowering period. Being an almost pure Sativa strain, the high is predominately cerebral, creating a relaxed, euphoric feeling, perfect for relieving stress, anxiety and depression. With a high THC content of 22%, together with an average CBD content of 1.5%, it’s a perfect choice for both recreational and medicinal users alike. All Sativa Star seeds purchased are totally feminized, and will produce only pure female plants. Distributed directly by Crop King, one of Canada’s leading cannabis seed producers, enjoy the best customer support from purchase through to harvest, with articles, growing advice and tips on how to get the very best yield and highest quality cannabis buds from your seeds. Supplies are limited, but you can buy Sativa Star feminized cannabis seeds in packs of 5, 10 or 25, enjoying big discounts on the larger sized packets. Click below to learn more. Buy Sativa Star Feminized Seeds today and receive fast discreet shipping to Canada and all US states.